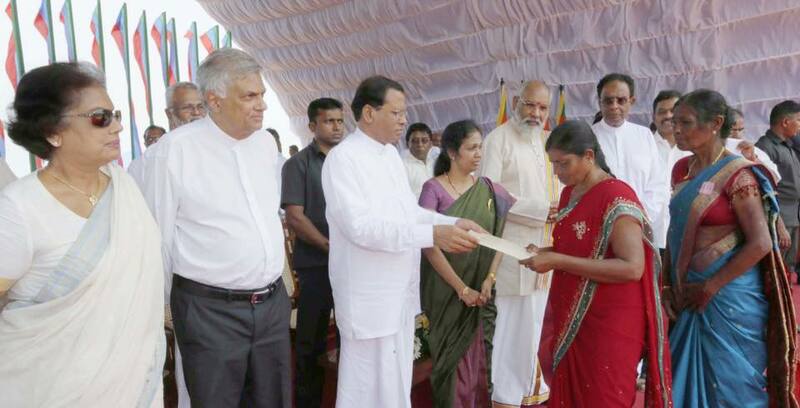 President Maithripala Sirisena has revoked an agreement with the Board of Investment of Sri Lanka to allocate 800 acres of land for investment projects in Sampur and released the land to be used to resettle people who had been displaced from the area. He had also directed that a navy camp set up there should also be relocated to enable the resettlement of the displaced people. The people were displaced in 2006 when the Sri Lankan military retook the Sampur area, which had been under LTTE control. The LTTE used the strategic location at Sampur to fire artillery into the nearby Trincomalee Harbour and naval base. Thereafter the land was taken over by the government for its own purposes including a naval camp and high security zone. Sections of the opposition have been critical of the President’s decision and said that he is jeopardising national security. However, the Governor of the Eastern Province Austin Fernando, who was also a former Defense Secretary, has responded that the decision had been made after discussion with the military authorities, including the Navy Commander. The President’s actions indicate that his thinking on security is not focused only on control of physical assets, such as land, but also on winning hearts and minds. The value of Sampur is not limited to its strategic significance. The location of the planned Indian coal fired power plant is also in the Sampur area which increases the economic attractiveness of the land to prospective investors. Land has been taken over by the government not only in Sampur but also in other parts of the country, including Colombo for investment purposes. However, the decision of the former government to vest the land in Sampur in the state, and to designate it as an investment zone was not done with the consent of the people or after finding them alternative lands to meet even their minimal satisfaction. The net effect was that they were arbitrarily evicted and had to spend nearly a decade in welfare camps. The forcible expulsion of people from their homes and lands where they have traditionally lived is a fate that all communities living in Sri Lanka, and particularly in the former war zones of the North and East, have had to face. The Muslims living in the North experienced this fate on the largest scale at the hands of the LTTE in 1990. It was only after the final military defeat of the LTTE in 2009 that the door opened for them to return. There were also smaller villages in the border areas inhabited by people of each of the three communities who were forced to leave their homes and flee, and are today too scattered to return. There is however a significant difference between war time displacements and the post-war displacements that took place during the period of the former government. During a time of war each of the warring sides would give maximum priority to strategic considerations and to their security concerns. However, the inexcusable action of the former government was that even after winning the war, they persisted with the takeover of land on a large scale. They acquired the land of those who were poor and powerless giving security related reasons, but they took over land in such excess that they used it to build hotels and golf courses and even for agricultural usage of the security forces. While the main target was the land inhabited by Tamil people, as evidenced in the takeover of 7000 acres of land in the Jaffna peninsula, they also took land in Sinhalese inhabited areas, most notoriously Panama, the remote and beautiful Sinhalese village in the east. These were all taken over after the end of the war. President Sirisena’s decision to return the land to the people is an exemplary act of political leadership. He did it without hesitation, without propaganda or fanfare. Only decisive political leadership could have accomplished this victory for justice. In the past there have been many attempts made by the displaced people, with the backing of civil society groups, to obtain justice from the state but without success. In the case of the land taken over in the Jaffna peninsula, there are some 2000 cases outstanding in the courts. One of the civil society organisations that has been most active in this regard has been the Centre for Policy Alternatives. In a statement issued after the President’s decision to release the land in Sampur, CPA said that in 2007, a High Security Zone was created preventing around 12,000 people from returning to their land. After CPA filed a case in the courts on behalf of the affected people, the size of the HSZ was reduced, allowing some to return to their land but continuing the displacement of several others due to the existence of a smaller HSZ. Subsequently the establishment of the Special Zone for Heavy Industries in 2012 perpetuated the displacement of the people even after the war. This calls for the government to re-examine the existence of arbitrary HSZs and the occupation of land by security forces and others without adherence to due process. Another example would be the village of Mullilkulam on the sea coast in the northern Mannar district. This too has been taken over by the military for a naval camp after the end of the war. Today nearly six years after the end of the war, these people continue to live in cadjan huts next to scrub jungle. Their livelihoods are gone. Their church is in the middle of the navy camp. They have access to his church, but it is not the same as having the church in the middle of their village as it used to be. Most of the irrigation tanks that they used for cultivation are no longer accessible to them. The continuing neglect of Mullikulam does not reflect positively on the spirit with which the government’s intention to promote reconciliation in the country. The people of Mullikulam are amongst the large group of people who lived in the North and East, who got displaced several times during the course of the thirty year war. They had been first displaced in 1984. They returned after two years, but they were displaced again, and yet again. On every occasion they nurtured the hope that they would be able to return one day to their old homes and homesteads. Mullikulam is a Catholic village. The distress of some of the Catholic clergy I met was evident. They spoke about structural disempowerment and the need for power to decide for themselves because they could not trust those from outside their region to decide fairly and justly. After seeing the continuing plight of the people of Mullikulam, and the broken promises of the government, I could see why these ideas continue to hold sway amongst sections of the Tamil people both locally and in the Tamil Diaspora. There is currently a growing sense of frustration amongst sectors of the Tamil polity that the government is not engaging in political reform that will address the grievances of the Tamil people. The passage of the 19th Amendment which reduces the powers of the presidency, and shares it with parliament and other independent institutions, is a first step in the process of power sharing. The other reforms will happen as the reconciliation process gathers strength. The return of land, in Sampur, Jaffna, Mullikulam and Panama is part of rebuilding trust between the government and the people, which is the best guarantee of national unity.